“The photographs were a big mistake” she begins, laughing at the two portraits of her younger selves that adorn both covers of the novels on display. “It’s so unfeminist to have your own face displayed, such a distraction.” It strikes me then, that this wonderfully easy, elegant woman on the dais before us, speaks from experience of a whole other generation of activism. Born in 1933, Devaki Jain is one of India’s most renowned feminist economists. A Padma Bhushan awardee and founder of the Institute of Social Studies Trust in New Delhi, she has been actively involved in public policy both at home and abroad. 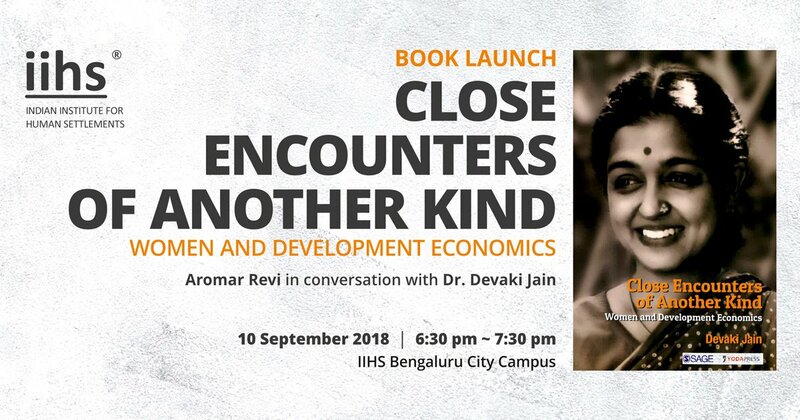 For years, Devaki Jain has spoken of the need for a new economic theory and today, at the launch of her latest book in the Indian Institute of Human Settlement in Bangalore, she brings it up again. Describing the collection of essays in her book as “an argument against the definition of economics in the South”, she shakes her head in disappointment as she recalls Manmohan Singh’s liberal economics. Despite critiquing the capitalist corporates though, she repeatedly clarifies that one “does not have to be a Marxist to be fair”. Referring to the detrimental “development aid” from the West, Jain emphasises on the need to understand the specifics of Indian economy better. What comes next though, is a twist in the tail. “What we need is a new economic theory of the Aam Aurat” says Jain, shifting to the edge of her seat. An economic restructuring initiated by a manifesto from the feminists as a whole, coming together under a collective identity despite differences. Feminist economics, she clarifies, is not about gender but an “ethic”. In an article written in 2007, Jain addresses this very dilemma of definitions – both rejected by women and crucial for policy. Published in the Economic and Political Weekly, her article goes on to point out that the free market model would work best if demand was that of the poor. The women’s movement, Jain continues, has focused a great deal on “bodily issues” or harassment and media portrayal but women workers remain unrecognised by standard measures of economic growth. Describing the GDP as an “ogre”, she says that while feminists have dwelt on politics of the care economy and domestic labour, even product labour that fits the traditional definition of work, goes unacknowledged. With forest produce for instance, lumber (most often collected by men) is considered major produce while collection of berries (by women) is considered minor produce, despite the fact that the monetary value for berries is significantly higher than that of lumber. Towards the end of her brief but intense speech, Aromar Revi the director of IIHS, opens up their conversation for questions from the audience. As many ask for solutions of some kind or another, Devaki Jain begins to look defeated. “I don’t have an intelligent answer,” she repeats, “after 15 years in the field, I am lost”. But then comes a question from an economics teacher about ways in which to educate the young and she looks around the room and laughs. “Most of you here are my age but to those few students…” she scans the audience and smiles “I have faith in the young people. They seem to want to hold posters and protest”. Noting that this wasn’t true of her own generation, she says the young must be careful to bring out the economics in their politics. Where are they now? When was the last time you had a Post Man bringing you letters? Devaki Jain is an inspiration. I’ve been fortunate to have worked on a project headed by her. I cannot agree more with the thrust on speaking about gender economics. We need to document the world and study archival material of women in the past. It is time we had Her’story (vs History) and got equality moving. It would be one of nurturing and raising a kingdom after the last battle would have killed or maimed all able bodied men…. how different this world would seem. Unpaid, undervalued and yet women continue to raise the world.